Intergenerational Change Initiative (ICI) was created to support municipalities to promote youth participation and intergenerational policy-making. ICI works with government entities to adapt a technology-based, intergenerational, participatory policy-making (TIPP) approach. Using the infrastructure of youth councils around a city/country, a youth participatory action approach and mobile technology, the TIPP model gives government entities the opportunity to have youth policies, generated by evidence, coupled with a commitment to broad and diverse participation in both the process and product. It can be used to enhance (1) who can participate in political processes, (2) how quickly and democratically the data can be made available on the ground to communities and up the policy trail to representatives, and (3) who can access and analyze the data to inform policy making and local action. Once this civic communication infrastructure is set up, it can be activated to promote ongoing dialogue between young people and their policy makers as well as offers a rapid response system that can be used by youth and adult governing bodies to mobilize youth in times of crisis. This model, in conjunction with other civic initiatives, creates a rich civic ecosystem that citizens, of all ages, desire and deserve. Zeller-Berkman, Sarah (2014). Rolling Thunder: The Collective Impact of Intergenerational Youth Policy Making in New York City explores the potential for implementing an intergenerational policy making approach in New York City that activates networks of youth councils (Beacons, Cornerstones, Community Schools, COMPASS as well as other DOE, CUNY, city agency or CBO youth councils around the city) to use mobile technology to collect data about youth policy issues from community members of all ages. 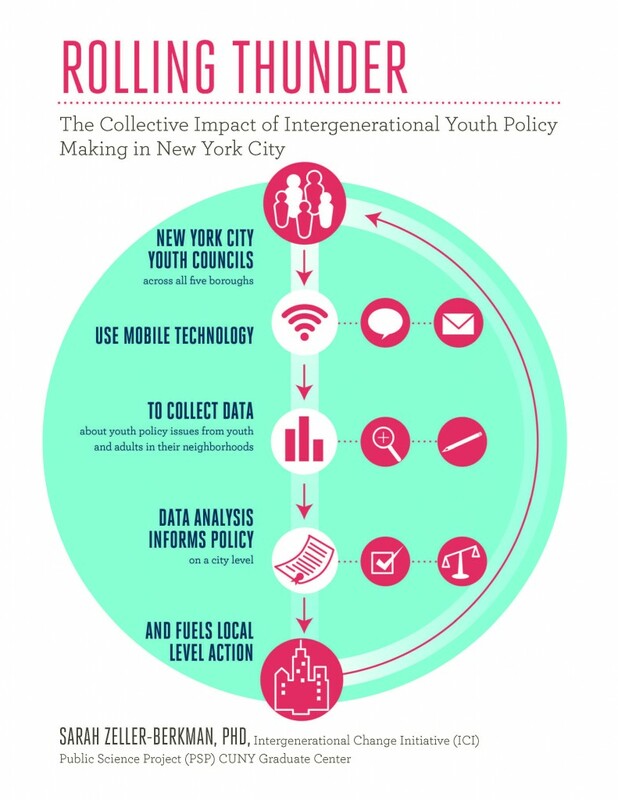 This concept paper gives historical background on youth participation in governance locally and nationally, outlines in greater detail the core components of this intergenerational model, and offers recommendations to the de Blasio administration about how to leverage young people and youth programs around the city to maximize the impact of the youth policy making process.